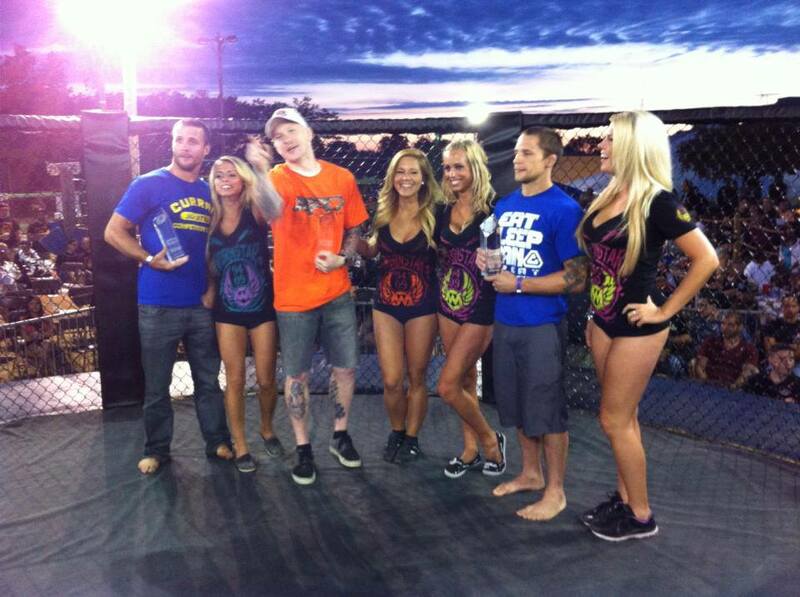 XFO, the Midwest’s longest running professional Mixed Martial Arts promotion, produced yet another memorable show at its annual summer extravaganza at Sideouts Bar & Eatery in Island Lake. “Outdoor War 9” saw several spectacular finishes on a card featuring more than 30 matches, as well the induction of the inaugural class of the promotion’s Hall of Fame. The event also saw its share of controversy. Promoters had to scrap the main event, which was to pit Felice Herrig against Amanda Lavoy. The Illinois Athletic Commission did not clear the fight after Lavoy’s eye test results failed to meet Illinois state standards. Lavoy and Herrig were supposed to fight in a K-1 style match. Although Lavoy/Herrig never went through the night still saw highlight reel knockout finishes. The new main event, featuring Herrig’s Team Curran teammate Joey Diehl against downstate veteran Wade Choate, saw lots of stand up action. 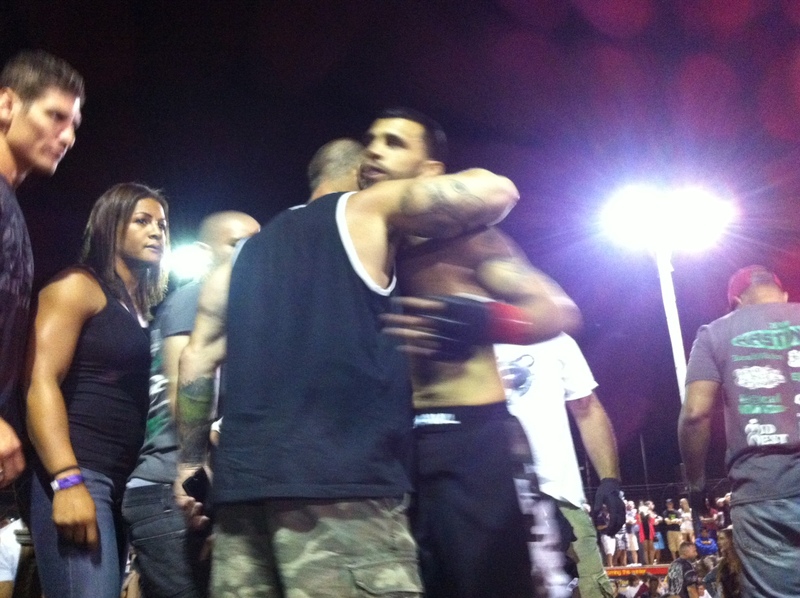 Wade put Diehl away with a head kick KO in the first round. The co-main event also featured a head kick knockout in true blink-and-you’ll-miss-it fashion. Quartus Stitt(Midwest Training Center) blasted Lawrence Dunning (Team Curran) with his right leg, earning the KO in a match that lasted just six seconds. – Heavyweight Wes Anderson(MTC) dropped JR Briones (Waukesha MMA) with a thunderous elbow to the temple before finishing him with punches to earn a first round TKO victory. – Pedro Velasco (Team No Comment) put Vince Romandine (Team Curran) to sleep with a first round arm triangle/technical submission. – Oliver Vazquez (MTC) earned a unanimous decision over a bloodied Christian Reynoso (Team Curran) for his first professional win. The inaugural XFO Hall of Fame class featured some of the sport’s biggest names: Jeff Curran, cousin Pat Curran, UFC lightweight Clay Guida, and former UFC lightweight Bart Palaszewski. Guida is at Greg Jackson’s gym in New Mexico preparing for a fight with Chad Mendes in UFC 164 later this month in Milwaukee. Guida’s parents were on hand to accept the honor on his behalf. Jeff Curran is fighting Pedro Munhoz for Resurrection Fighting Alliance’s bantamweight belt next Friday. Their fight is the main event of RFA 9, which broadcasts live on AXS TV. Jeff’s cousin Pat is the reigning Bellator featherweight champion but doesn’t have an official match scheduled. He is hoping to be part of the promotion’s first pay-per-view show in November. Palaszewski is looking to earn a return to the UFC after he was released, following a loss to Cole Miller at the TUF 17 finale last April. 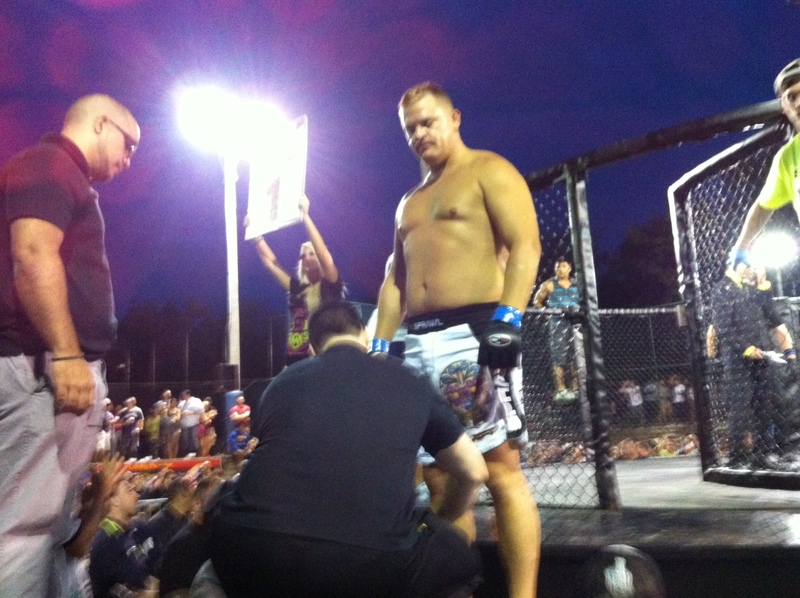 MTC Heavyweight Wes Anderson showed devastating power with his elbows and punches in the cage Saturday night. You can see all the described action on “The Best of XFO” which airs on Comcast Sports Net. The episode spotlighting “Outdoor War 9” debuts Friday August 23. In addition to the pro matches and Hall of Fame ceremony, the show’s producer says highlights from the amatuer matches will be included. Be on the lookout for a double knockout and a rare banana split submission.